What helps create beautiful flowering gardens and big, juicy fruit and vegetables? 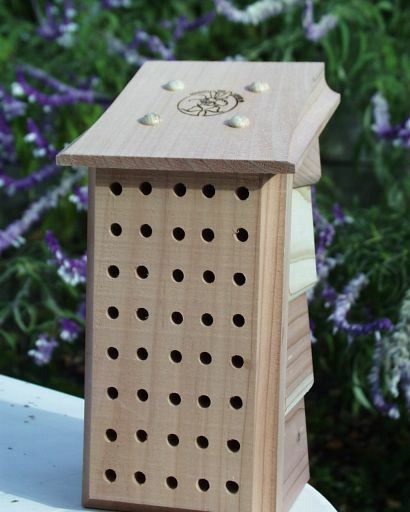 Attract Mason Bees to your garden. Small, blue-black Mason Bees are nature's mild mannered, peaceful pollinators that bring bountiful harvests to gardens and orchards. We Need The Bees! In the last few years, the honeybee population has plummeted from an onslaught of foreign mites and viruses. The Orchard Mason Bee population has not been affected and is the planet's most effective pollinator. And The Bees Need Us! Mason Bees are unable to tunnel holes for their nests - they rely on existing holes of the right size. By providing nesting sites, we can help these bees fulfill their life's mission, while they provide us with better quality gardens and crops. Handcrafted from durable, recycled redwood. The diameter of each hole in the Mason Bee Lodge is 5/16 " - the recommended size for Orchard Mason Bees.